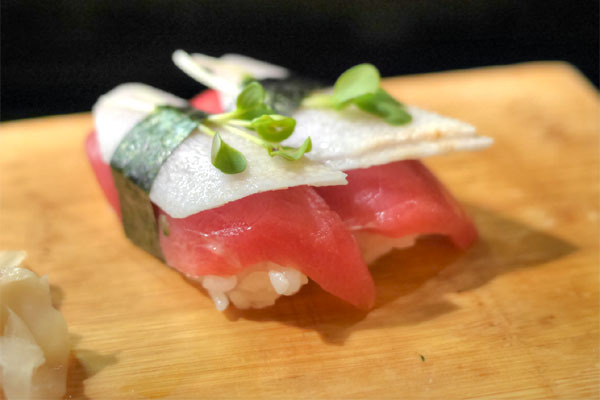 When talking about San Diego sushi, Ota seems to be the one that gets the most mention. However, over the past several years, I've heard more and more about Kaito, and decided to give the place a shot. The restaurant is owned by the husband-and-wife team of Ryan Bertsch and Hiromi Kimura (they also run the nearby Sugar Coffee & Tea), and debuted at the start of 2005. Back then, the place was situated at another location about a block away, but moved to its current digs in April 2008. 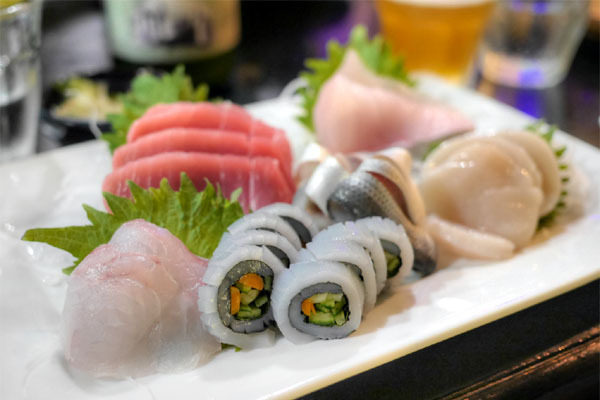 Along with the move came a revamped menu focused on edomae-style sushi, with the former Italian-ish items dropped altogether. 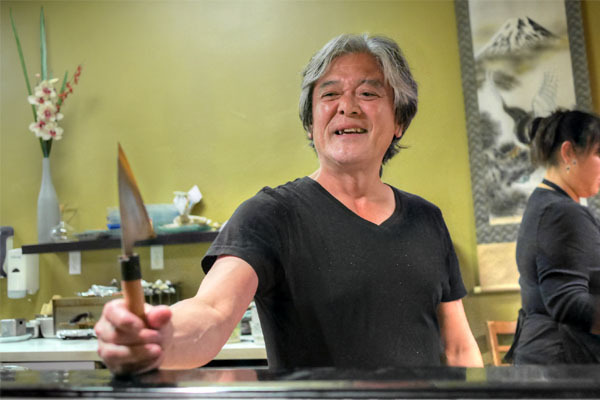 Meanwhile, helming the kitchen here is Kazuo Morita, a Tokyo-trained sushi chef since age 18 that's worked in the San Diego area since 1986. He's spent time at Tomiko in Encinitas, Nobu in Solana Beach (unrelated to Mr. Matsuhisa's places), and the old school Yae in Rancho Bernardo back in the day. Assisting Kaz-san is Ryoichi Iwata, more commonly referred to as "Joe," who also worked at Tomiko as well as Ichiban in San Diego. Located in a strip mall, Kaito is about what you'd expect inside. There are a smattering of tables, but most of the space is taken up by the large-ish sushi bar, which seats around 14 diners. Kaito's à la carte menu comprises your usual selection of apps, noodles, bowls, nigiri, and rolls. We were here, naturally, for the omakase though, which tonight ran $69 a head. To drink, there's your typical Japanese beers, as well as sake, though corkage is offered at $10 a bottle (we weren't charged, however, possibly because we shared with the Chefs). 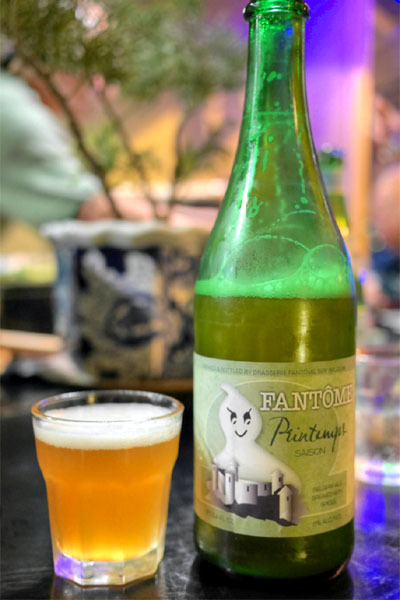 I had two beers with me tonight, the first being the 2014 Fantôme Saison D'Erezée Printemps, a Belgian saison brewed with seasonal herbs. I found it rather interesting, with a distinct tinge of sweet spice on the nose, while on the palate, I got a light farmhouse funk leading to a very robust finish teeming with notes of fennel and oregano. 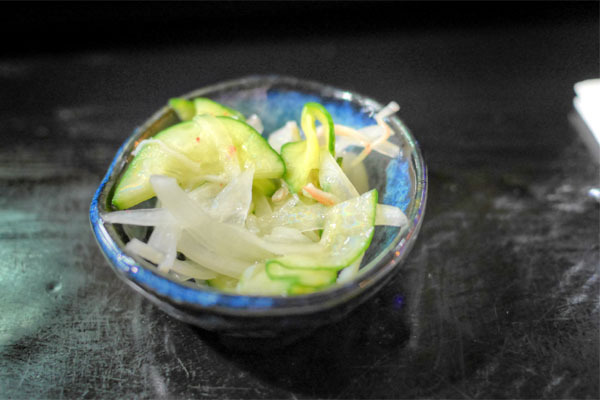 Quickly set before us was a vinegar-y salad of cucumber and onion, a bright, bracing combination that worked as quite the palate cleanser. 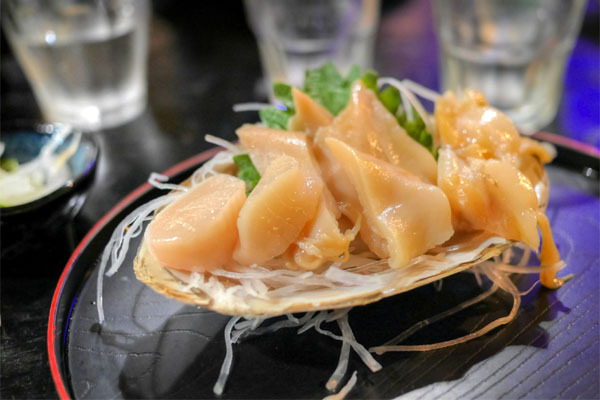 Kaz-san got us going with a delightful sashimi of orange clam. 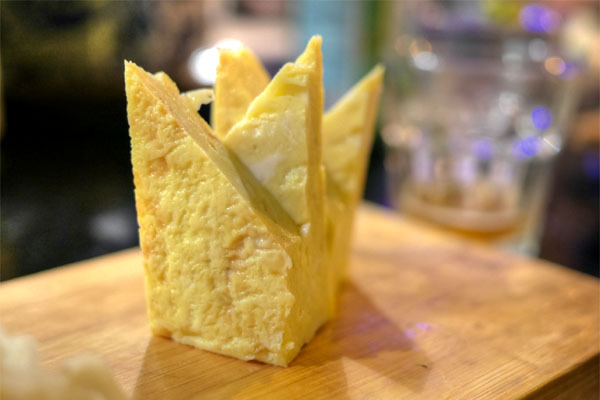 It was a fantastic mix of textures, both spongy and crisp, and a showcase of sweet, subtle salinity. Tasty alone, and even better with a dab of wasabi. 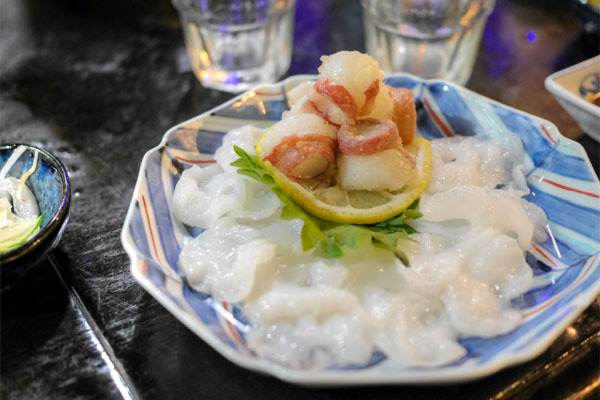 Raw octopus was satisfyingly chewy, with a nice snap and light brine to it--excellent with a bit of 'sabi. The raw preparation was joined by deep-fried suckers, which were wonderfully savory, with a consistency that blended both crunch and spongy. The assorted sashimi platter brought out a variety of treats: a light, sticky snapper that really opened up with some soy; some well-textured, very sweet hotate; sticky, gelatinous squid rolls; creamy chutoro that really called for some soy and wasabi; some dense, clean amberjack; and finally, the firm, fishy sashimi that is kohada. Next up was the so-called round greeneyes, which I'd had once before at Mori Sushi. 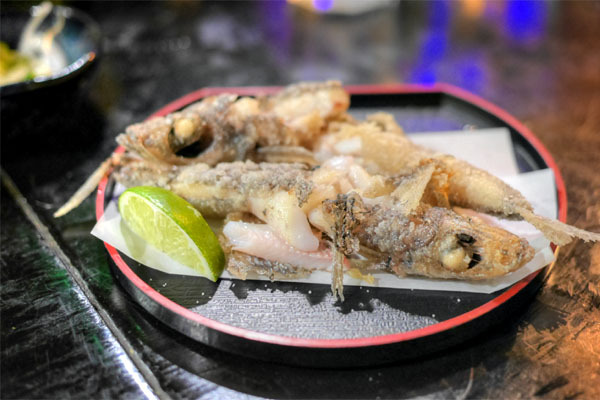 Served fried and eaten whole, they were really quite delicious, conveying a deeply pleasurable savoriness and crunch. 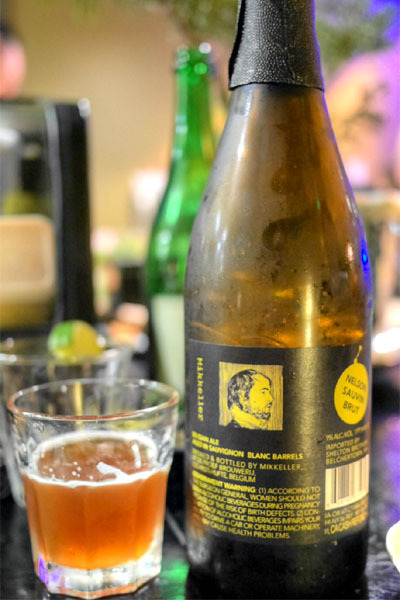 My other beer was the Mikkeller Nelson Sauvignon, a Belgian golden ale brewed with Brettanomyces and aged three months in Austrian white wine barrels. I really liked this one, finding it expectedly funky and tart, but with a dry, vinous quality to it that really hit the mark. 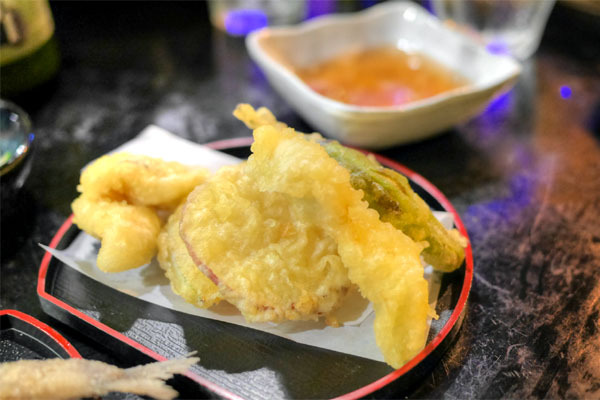 Kaz-san then sent out a spot on rendition of tempura, this one featuring sea eel. Beautifully textured, with the saline essence of the anago well-matched to the tangy tentsuyu-like dipping sauce. Tuna was paired with mucilaginous yamaimo mountain yam and zesty kaiware daikon sprouts in this somewhat seldom seen presentation of sushi. 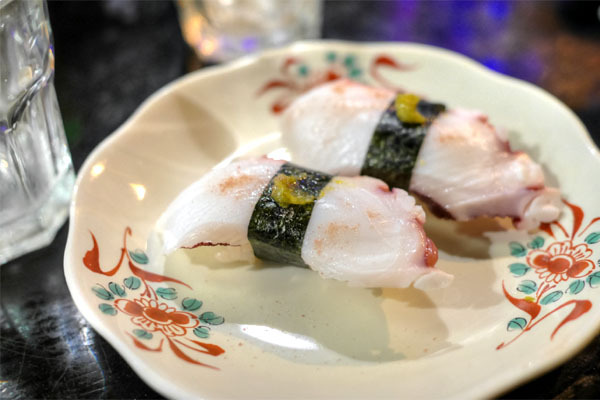 Octopus nigiri was a perfect example of such, with the tako's excellent snap and mild savor pairing wonderfully with a hit of yuzukosho. 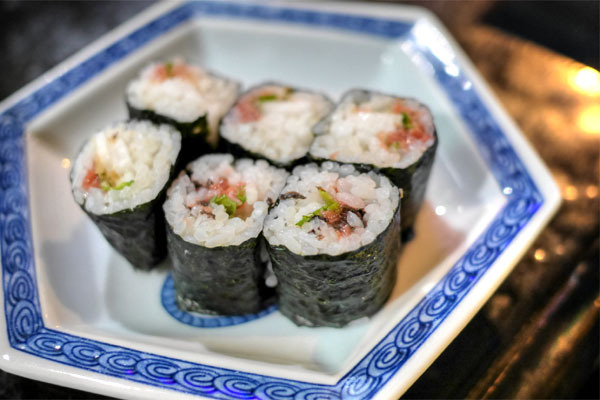 Next were cut rolls featuring ume, shiso, and more of that mountain yam, a tart, minty presentation grounded by the rice and umami-rich relish of nori. A traditional closer, the egg was cool and sweet, with an interesting cut to boot. Chef Kaz-san shows off one of the first knives he ever bought. Unfortunately, this was no doubt the shortest omakase that I've ever had, not due to any fault of the restaurant, but because I was super full coming in thanks to the meal I had at Carnitas' Snack Shack earlier in the day (and the beer I had at the four breweries I visited). I had to cut things short sadly as a result, so I didn't really get to experience the full breadth of what the kitchen is capable of. What I did taste was very promising though, so I have no doubt that Kaito can stand as one of the top sushi joints in San Diego. How is Omakase run here? Where it's called omakase but the chef has a set number of dishes he's delivering? Or they keep bringing it until you say stop? I am curious how to judge the $69 price point. Was it that price because you stopped? Is there a higher set price? Or is it a "sky's the limit" type of omakase place? Ours was the "keep going until I tell him to stop" style, with no price discussed beforehand.